Several years ago David Attenborough presented to the general public a documentary that made much of a stir because of the exceptionality of the film shoots but even more due to the extraordinary nature of the subjects that until then had never been observed so much closely in their daily activities. The programme had a title more than rousing,“Attenborough in Paradise” and already from the name of the programme transpired the beauty of the subjects treated, the much celebrated “birds-of-paradise”. Born as informative programme, this documentary is now accepted by the naturalists as fundamental base for understanding and knowing these so much elusive, shy and little known birds. During the XIX century, Alfred Russel Wallace, great scholar and expert of those still unknown parts of the planet, while studying these birds reiterated one of his concepts that remained valid over time namely that ….the living beings of the creation are so beautiful that they cannot have been created for us humans! The first dried skins of these birds reached Europe on the Dutch commercial vessels of the XVI century, along with the spices purchased in the far away Moluccas but these specimens were coming from even more distant lands, therefore it seems that nobody by that time, had had the possibility to observe them alive in the wild. These findings had no wings as well as no legs as the natives, before trading them, did cut them and held these appendages for adorning their fancy costumes. It was so that those who, the first, had the possibility to study them, found themselves in front of apod and apteran birds, characteristics that fed the belief, referred by the natives and repeated by the traders themselves that these birds did live in paradise, always suspended in the air without ever touching the ground if not when they passed away and only by that time they were collected by the humans. Consequently, they were classified as paradisiac and apod birds. The Greater bird-of-paradise (Paradisaea apoda) still carries in its scientific name, the result of this first classification. It’s an Italian, moved by another far interest and casual eyewitness of this meeting, to bring the first the complete description of this bird to Europe, giving a more earthly explanation to this imaginary story. This man was Antonio Pigafetta, from Vicenza, to bring these news that dissipated any previous and fabulous interpretation. Onboard chronicler of the first voyage of world circumnavigation, headed by the intrepid Magellan and survivor, though injured during the battle against the king Lapu Lapu in the Philippines where he saw his Master dying, along with few others to this terrible marine experience. In his journal he described the three years of terrific adventures, diseases, disastres and the death of the same Commander of the mission, but, as good chronicler, reported that he got to see these birds coming from the Garden of Eden where they lived in great number and species. It was the 1521 but the journal was found and read only by the end of the XVIII century. The Paradisea minor, or more simply, the Lesser bird-of-paradise (Paradisaea minor – Shaw, 1809) belongs to the order of the Passeriformes and to the family of the Paradisaeidae that groups a fifteen of genera and 42 species, the whole big group of these magnificent birds. Also in this family there is under way a deep taxonomical reclassification and so new revelations and modifications will not be by sure unexpected. Curious is the etymology of the genus Paradisaea coming from the Greek “paradeisos” but in turn gotten from the old Persian “pairi-daeza” that indicated the garden enclosed by walls, land of pleasure of the Persian kings. The name of the species comes from the Latin “minor” = minor, to differentiate it from the apod congener, quite similar but bigger. Also the old name given in Europe to all these birds,Manucodia/Manucodiata, denomination maintained nowadays only for the genus living in the York Peninsula, in Australia, had a heavenly derivation, in fact it was the result of an ill-transcription from the Javanese language of the appellative “manuk dewata” that rightly meant “birds of the gods”. In the western world is practically receipted the concept reiterated with the scientific name: Lesser Bird-of-paradise in English; Kleiner Paradiesvogel in German; Ave del paraíso Esmeralda Chica in Spanish; Paradisier petit émeraude in French; Ave do paraíso pequena in Portuguese and Paradisea minore in Italian. 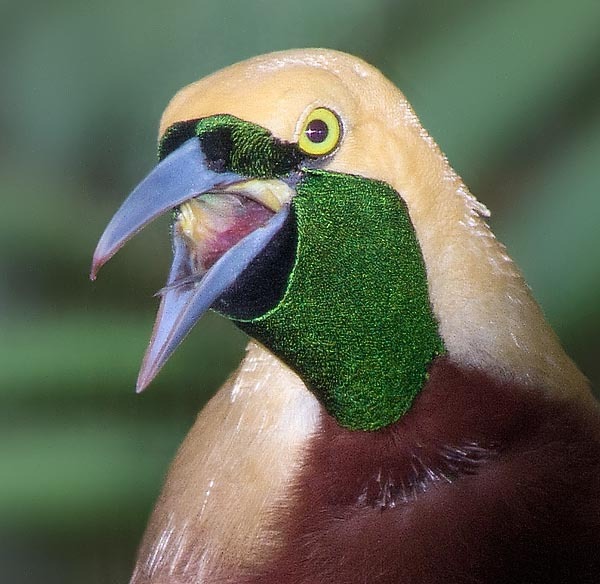 The area where these birds live is limited to few islands of the Indonesian Moluccas and to the New Guinea, in the Indonesian part of the Irian Jaya as well as in Papua New Guinea. Only marginally, some species live in the Australian Queensland. The lesser bird-of-paradise lives in the northern part of New Guinea, the Misool and Yapen islands. A territory densely covered by thick and often inaccessible forests that jealously preserved many of these secrets up to our days. It is believed that it is a sedentary bird. The life of this Paradisea is confined in the thick and humid forests of the Equatorial belt, dotted with marshes and high trees, with dense and impenetrable undergrowth. It is a typically arboreal bird that rarely comes down to the ground and that spends practically its life hidden among the foliage of the forest canopy, solitary and mostly silent, often unnoticed in spite of the sparkling colours of its livery. Up there are the fruits it nourishes of and also insects and small vertebrates that at times complete its diet. Also the searching of the parther and the courting take place on the foliage of the branches unlike other species that take advantage from the lek, the common exhibition and competition spaces on the ground, for attracting the partner. Perhaps this style of life it has, so distant from the soil, its fleeting appearances when looked for among the high tops and the awe for the lightness and the gracefulness of its feathers, have been standing among the causes that have suggested its name. However difficult to discover when immersed in the greenery of the forest canopy, the lesser bird-of-paradise has a fair size, exceeding the 30 cm of length, the 300 g of weight and a wingspan of about 60 cm. All of them display a marked sexual dimorphism so much to lead to think, when comparing the two sexes, to two different species of birds. Whilst the female shows a mild and unattractive colour, that of the male is a real explosion of hues and shapes. 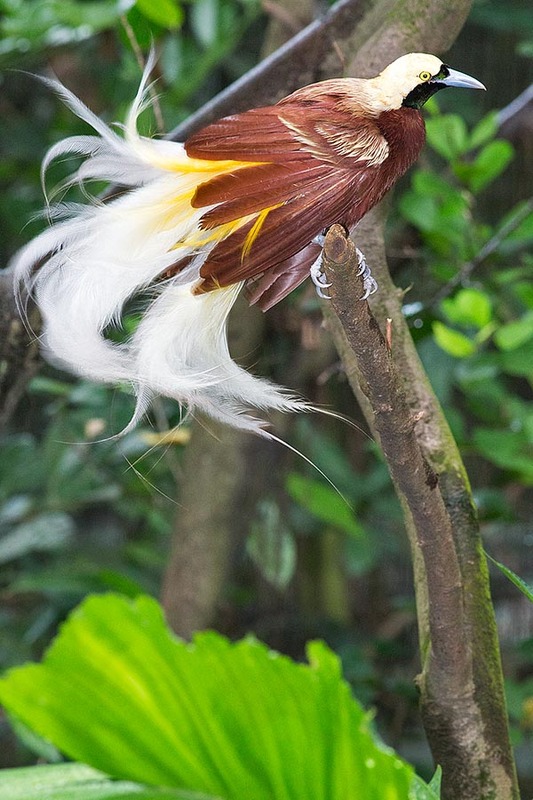 The female of the lesser bird-of-paradise has maroon coat and black head with the chest completely greyish white. The neck has a slight yellowish nuance and the throat a bluish green reflection. The bill and the legs are light bluish and the eye is of a bright yellowish white colour. Conversely, the male is a real palette of colours: head and nape are lively lemon yellow, bright emerald green throat, chest and abdomen of more or less marked brick hazel colour. The alar cover and the tail are hazel with some yellowish shades on the shoulders, beak and legs are light blue. To all this we add a fountain of long and vaporous lemon yellow feathers fruit of a disproportionate elongation of the coverts of the sides that get to double the length of the tail. Furthermore, from this last depart two very long and thin filiform feathers, dark brown, almost invisible that disappear among all these colours. The eyes are of a very bright yellow colour. The maturity is reached in the second and also in the third year. There is no doubth that the epithet of bird-of-paradise is well deserved. 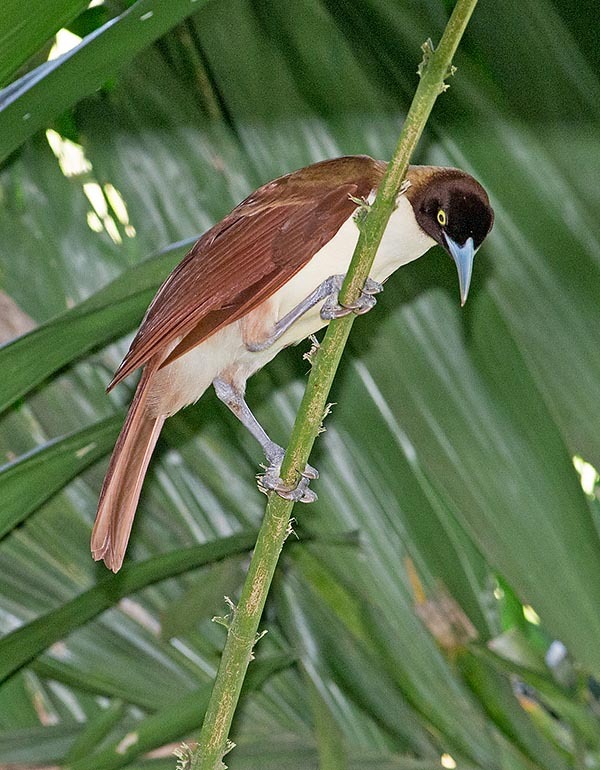 Also this bird-of-paradise exploits common areas for exhibiting and conquering a female. More than a lek, usually located on the ground, it uses branches at more or less high heights on which it does its dances, jumping from branch to branch hanging upside down and letting its vaporous feathers to fall backwards. In that position one has the impression of seeing a strange chandelier, soft and coloured, swollen to such an extent to render indistinguishable the shapes of a bird. The courting phase serves to excite and impress the females that rush perching on the nearby branches, waiting to judge and concede themselves to the best of the exhibiting males present in the arena. Hops, raucous verses, flapping wings, flickering of the body, a real amorous frenzy that hopelessly attracts the females present. So much short is the coupling, so much ephemeral is the relation with the father of its own offspring. Once the mating is ended the females immediately run away into the thick of the forest and since that time all contact is lost. The male is polygamous and can mate with more females. There is not a specific season for the nidification as we can note couplings in all periods of the year. The nest is built by the female on the high branches of a tree, hidden among the leafy branches, where lays, as an average, two pinkish eggs (one to three) that it will brood for three weeks about. The small nestlings will remain in the nest for four more weeks before going away, initially on the nearby branches and then later on fledging. The young will keep united with the mother for some time more forming small familiar groups up to the new reproduction season. Cases of hybridization between species have been observed, inside as well as outside the same genus. Specimens previously classified as independent species have been later on judged, after careful genetic studies, as interspecific hybrids. In the past this bird has undergone heavy persecutions for getting the precious feathers that were required by the western fashion. Also the local populations have always hunted it for the same reason, still maintained custom and guaranteed by the law done to protect these birds. In Irian Jaya and in Papua New Guinea to carry feathers of these birds on the headgears, is for the natives source of pride and honour that cannot fail to produce in every social occasion and celebration. So much that the figure of this wonderful bird is represented in the national flag of Papua New Guinea. The species is not considered as endangered.